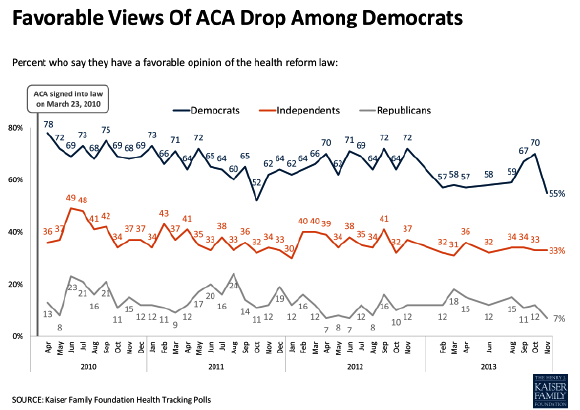 Support for the new health care law took a beating in November – particularly among Democrats – during a period when many Americans paid close attention to the heavy news coverage of its problem-plagued rollout, according to a Kaiser Family Foundation Health Tracking poll released today. The biggest drop in support for the law was among Democrats, amid concerns among some party lawmakers that the troubles surrounding the law would exact a political toll in next year’s midterm elections. The Kaiser survey found that Democrats holding a favorable view fell from 70 percent in October to 55% in November. During Kaiser’s polling since the law was enacted in 2010, support among Democrats was mostly in the 60s and 70s, although prior to October, it had fallen to the high 50s earlier this year. More than half (55%) of the public surveyed in mid-November said they followed news about the woes of the website-based insurance health coverage exchanges “very” or “fairly” closely. The same number also paid close attention to reports about people being dropped from their current coverage due to the law’s provisions. In the wake of the negative news, the share of those with an unfavorable view of the law rose to 49% in November, from 44% in October. The number of those seeing the law positively dropped to 33%, from 38%. Kaiser said that the 16-point gap between those seeing the law positively and those with a negative view had only been as large once before — in October 2011 when the measure was drawing heavy criticism from Republicans during the presidential primaries. A CBS News poll released earlier this week and conducted during roughly the same time as the Kaiser survey found a similar drop in Democratic support. Nearly three-quarters (74%) of Democrats said in October they approved of that measure, a number that fell to 58% this month.